It has been over a week since the 2016 SLA Annual Conference came to a close. Now with the conference in my rear view mirror, let me talk about a few more sessions and other things of note. Attendance at the SLA Annual Conference has shifted over the years, in terms of how many people and what type of libraries/organizations they are from. It has always been a "big tent", meaning that many people could look at SLA and see it as a conference they needed to attend. SLA is continuing to work to ensure that it remains a big tent. To ensure a big tent, SLA has decided to move its 2018 conference from North Carolina (NC) to someplace else, because of the HB2 legislation. HB2 makes NC unwelcoming for transgender individuals. Libraries are considered safe spaces and librarians are frequently people who act with a social conscience. In moving the 2018 conference, SLA is acting with a social conscience. Not every SLA member agrees with moving the conference, but it seems like the vast majority do, myself included. I want SLA to be a safe place for everyone, no matter the person's religion, ethnicity, or gender identity. Now, NC could repeal HB2 before SLA moves the conference. That's a possibility. It is also a possibility that the 2018 conference will be scheduled for someplace else and then NC will change the law. In that second scenario, our voices will have been added to many others to get that change made and that would be a good thing. And while the 2018 conference would be someplace else, it also means the way would be paved for us to schedule a future conference there. 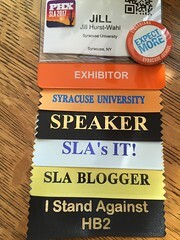 When I first began attending the SLA Annual Conference in the 1990s, I would go to as many sessions as humanly possible. I would soak in a dizzying array of information, frequently focused on what related to my corporate librarian position. My goal was to hear and be able to apply it. My goal is still the same, although I go to fewer sessions now. I balance sessions, conversations, and exhibitors knowing that sometimes the most worthwhile activity is talking to someone and gaining from their knowledge. Now as then, what is important after the conference is knowing what I have learned. At one point in her keynote, Erika Andersen said, (paraphrasing) "...if you're going to remember anything from this talk remember this...." While she was willing to point something out, we all need to get in the habit - or maintain the habit - of pointing out those key learnings for ourselves. If you were there, what did you learn? If you were following the conference through social media and blogs, what did you learn that you want to remember or implement? And is there something you want to pass along to someone else? From my posts, I hope you can tell what I learned! I want to note two sessions that I was involved in. 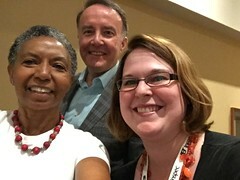 The Government Information Division held its annual business meeting on Sunday, which then led to a panel discussion on " Digital Copyright: What You Need to Know as Information Professionals." Christopher Kenneally (Copyright Clearance Center's Beyond the Book), Emily Lanza (U.S. Copyright Office) and I spent over an hour talking about copyright and fielding questions. While it was impossible to talk and take notes at the same time, I do want to point out one thing. The Copyright Office is seeking input on Section 108. They have put out this notice, Section 108: Draft Revision of the Library and Archives Exceptions in U.S. Copyright Law. This is a very readable document and so I encourage you to dig into it. If you would like to meet with the Copyright Office in order to provide input, you need to contact the Office by July 7, 2016 in order to get that meeting scheduled. Meetings will be held throughout the month of July. Thanks to Wolter Kluwer for sponsoring this session. Dorothea Salo arranged a session entitled "Helping the Help Desk" for the IT Division. Kendra Levine and I volunteered to help Dorothea with the session. When Dorothea's flight was cancelled, Kendra and I took over. We worked with the participants to brainstorm IT topics where they wanted help, and then we worked through the topics (all in one hour) to try to find resolutions. This was a lively, worthwhile session! We're librarians and we like helping people - especially other LIS professionals - which helped this session be a success. By the way, my suspicion is that the IT Division newsletter might have a wrap-up of this session in the near future. Thanks to Reprints Desk for sponsoring this session. 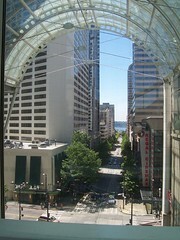 View from Seattle Convention Ctr. This was my 25th consecutive SLA Annual Conference. There was a time when I could list the conference locations in order. While I can't do that anymore, I can tell you all of the places they've been held since 1992: Philadelphia (3 times), Seattle (2 times), Boston (2 times), Montreal, Toronto, New York City, Baltimore, Washington DC, Atlanta, Cincinnati, New Orleans, Nashville, Indianapolis, Minneapolis, Chicago, San Antonio, Denver, San Diego, Los Angeles, San Francisco, and Vancouver. You'll notice a few repeats in that list and perhaps some overall patterns. First, while SLA is an international association, most members historically have been in North America and more east of the Mississippi than elsewhere. (Although perhaps that is changing.) Thus in 25 years, we've had only six conferences on the west coast. The only non-U.S. country to hold an annual conference has been Canada (3 times). Since 1992, the Association has held conferences in "smaller" cities - e.g., Cincinnati, Indianapolis and Minneapolis - with I believe mixed results. If you are attracted to a conference both by its content and its location, some cities may not be as attractive, especially if you perceive that traveling there will be a hassle. However, I can tell you that even a smaller city has things to do and food to eat! For me, being able to tour the Indianapolis Motor Speedway was a plus! What I've found over 25 years is that no matter the location, the conference is worthwhile. And if you're looking to vacation for a few days before/after, every location has something to see or do. There are historic places, museums, etc. to attract your attention. If you are willing to rent a car, there is even more! I encourage you to not eliminate a conference because of its location. Yes, really. Once back in Syracuse, I had the pleasure of hosting Paul Signorelli, as west coast colleague, who was in NYS for the New Media Consortium Summer Conference. What I learned from Paul is that there is an augmented virtual reality game called Ingress, which uses real-life/physical cities, buildings and public art as its battlefield. While this may not sound interesting to you, I'll tell you what stood out to me. There are people walking around our cities and campus who are playing this game. The game is leading them on adventures, which means they are seeing our surroundings from a different point of view (e.g., noticing details that we walk by) and doing to maybe at odd hours. 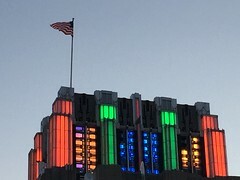 Paul and I walked around downtown Syracuse Friday night to "tag" buildings in the game, because you have to be pretty close to the actual structure to tag it (or capture it or defend it). If people are walking around your city or neighborhood as they play Ingress, what are they noticing? What is your neighborhood "saying" to them in terms of architecture, signage, etc.? Is your library building "speaking" things that will encourage the person to come back when it is open? Oh, and if you think the game is played only in well-kept areas, you would be wrong. Someone may have mapped out an interesting adventure someplace that is a little down-and-out but still has buildings, architecture or art worth being a part of the game. Let me note that the SLA 2017 conference will be Phoenix, AZ. I've been told that the lack of humidity will make the temperature more bearable. You up for it?